I got sent a free package of products to review for today’s unboxing, the e.l.f. Cosmetics Voxbox from Influenster. e.l.f. Cosmetics is a drugstore brand that I’ve owned and used before, but they’re always adding so much new stuff that I can’t keep up. To see what came in the e.l.f. Cosmetics Voxbox, then read this article. 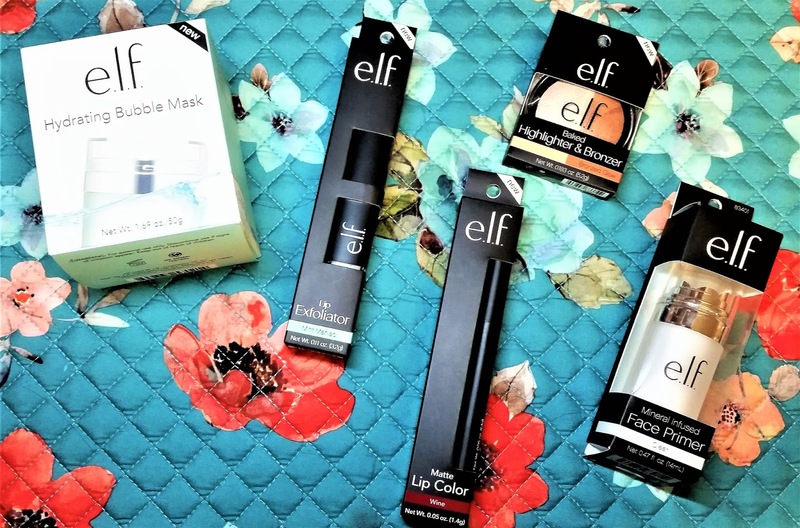 Influenster sent the e.l.f. Cosmetics Voxbox to the author of LeeNG Beauty for free for testing purposes. All opinions mentioned are strictly the author's own. I got sent a free package of products to review for today’s unboxing, the e.l.f. Cosmetics Voxbox from Influenster. If you’re not familiar with Influenster, it’s a website that you can write and read reviews that span a wide variety of products. They run these campaigns where you do tasks and earn badges for a chance to receive a Voxbox. The campaign I was selected for is from e.l.f. Cosmetics, which is one of the cheaper drugstore brands. I’ve owned and used some of their products before, but they’re always adding so much new stuff that I can’t keep up. The first item from the box is the Matte Lip Color Stick in shade Wine. This is a jumbo-sized lip pencil that is retractable but does come with a sharpener that’s built into the base. Not necessary, but they’re going the extra mile on this design by including a sharpener that’s BUILT IN and not just throwing one in. The sharpener is made completely out of plastic, so it doesn’t really work with anything else like eye or lipliner, which is fine because that wasn’t the intention. 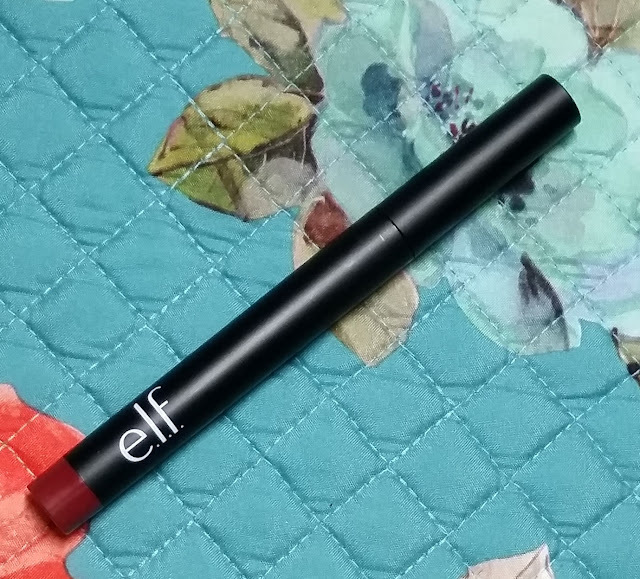 Lip Swatch of Matte Lip Color in Wine by e.l.f. Cosmetics. The Matte Lip Color formula contains Vitamin A, C, and E for moisturized and hydrated lips with pigment-rich color that applies easily for a long-lasting matte color. It may not appear matte in the lip swatch due to the lipstick reflecting direct light, but it does have a matte finish. The particular shade that I had received was Wine that’s described as a deep berry shade, which these types of colors aren’t really my thing. 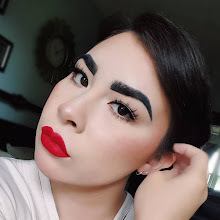 In the past, I have received dark berry shades such as the Noyah Cosmetics’ Natural Lipstick in Red Currant, which I’m using for comparison today. These two shades are both described as dark berry colors, but Red Currant is a vampy, violet-red, while Wine is significantly lighter and closer to a true shade of red. 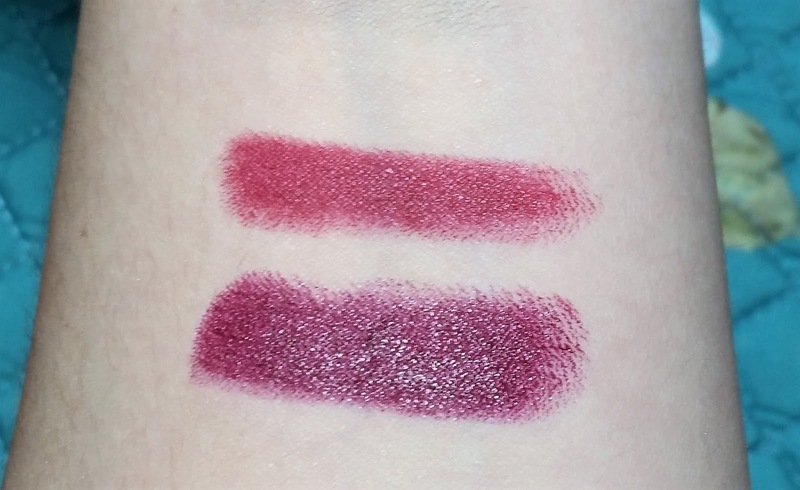 Comparison Swatch of Matte Lip Color in Wine by e.l.f. Cosmetics (top) and Natural Lipstick in Red Currant by Noyah Cosmetics (bottom). 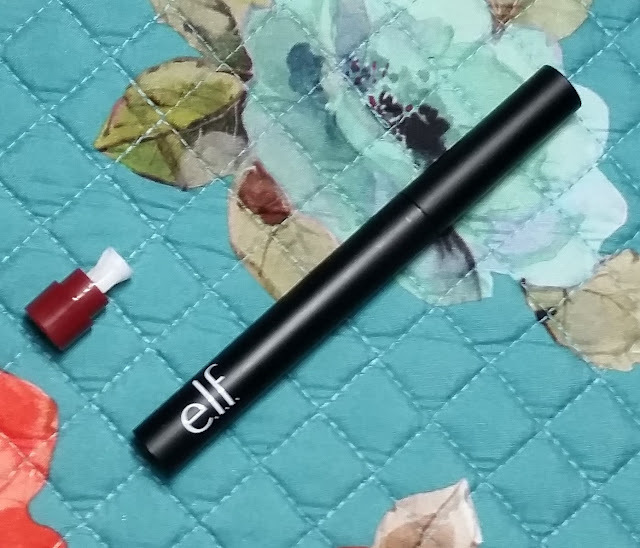 Overall, this product is pigmented, matte (yet comfortable for long wear), and it only costs $3.00 USD. Next item is the Mineral Infused Face Primer in Clear. 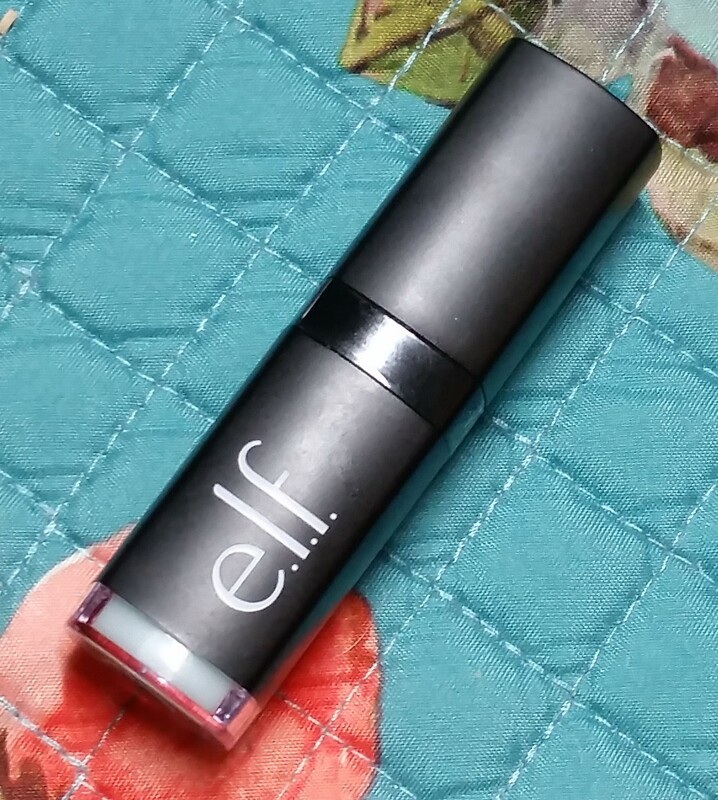 I’ve heard good things about the e.l.f. face primers, but never really got into using them because I don’t wear foundation that much. This particular primer comes in four shades: two that are color-correcting, one radiant glow, and a clear one that is multi-purpose. The one I received is the Clear, which is supposed to combat excess oil (as it contains tea tree oil), flaky dryness, enlarged pores and fine lines for a long-lasting, satin finish. That’s a lot to be claiming and a high-bar that they’re setting. In addition to enlarged pores, I normally have very oily skin. But lately my face has been drier in certain regions because I’ve been spot treating with strong acne medications, but it's not flaky. So, I’m not able to test whether this does combat flaky dryness and as I'm not even twenty years old yet, I can't test for fine lines either. Now, I did take this primer out for a test run, but I find this particular product to be tricky to test. I use nothing but matte, full coverage foundation, so whether this provides a satin finish, I do not know. When I do wear foundation, there are two that I alternate between depending on how much and what kind of makeup I’m wearing. For testing, I wore just the primer with foundation only. Since I was going to be out the house that day, I wore the Lock It Foundation in Light 45 with warm undertones by Kat Von D as it’s a closer shade match. This foundation is known for its long-lasting matte finish and non-cakey coverage. I like that it’s transfer resistant, so I don’t have to set it. Application-wise, you don’t need that much product to prime your face - I didn’t even use a full pump. I do find the texture of the primer to be unusual. 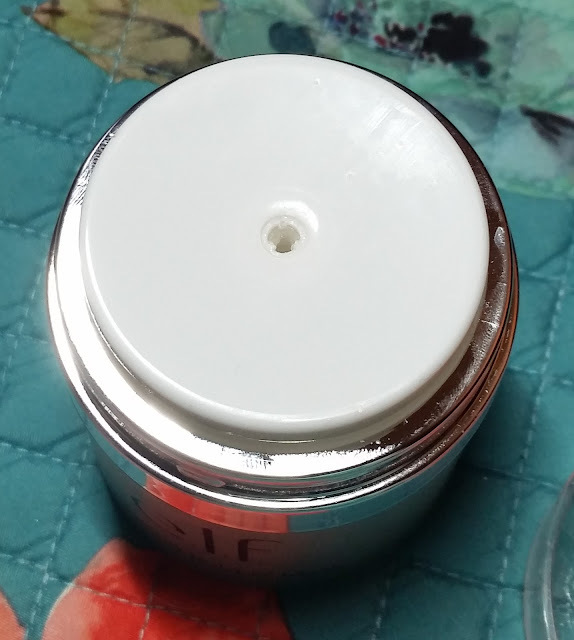 I’m used to the silicone feel of pore-perfecting and mattifying primers, but the Mineral Infused Face Primers has a slick, gel-like feel to it that can feel greasy for some. When used with the Lock It Foundation, I find that the primer makes very little difference in keeping the oiliness at bay. It doesn’t promote the longevity of the foundation either, but it does help perfect and minimize pores to where the area is completely smooth…for once. The Lock It Foundation does a good job of pore-perfecting, but the pores that are practically on the apples of my cheeks are rarely as well concealed as the regions closest to my nose. 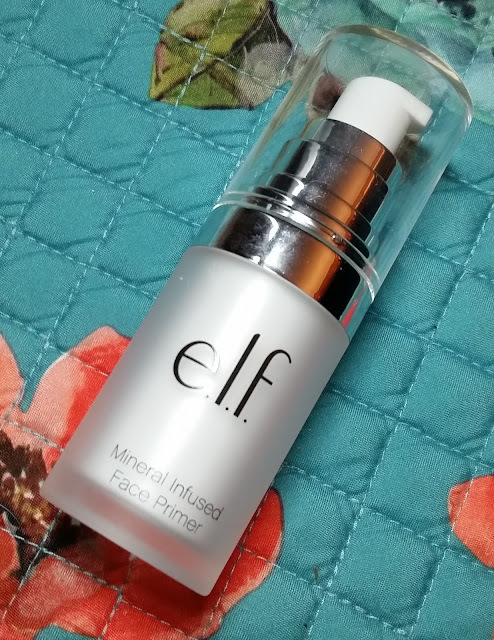 This is an issue I run into with other pore-filling primers but didn’t encounter this time, so the Mineral Infused Face Primer does help minimize pores. The third item is enriched with Jojoba, Apricot, and other skin-nourishing oils, the Baked Highlighter and Bronzer in Bronzed Glow. 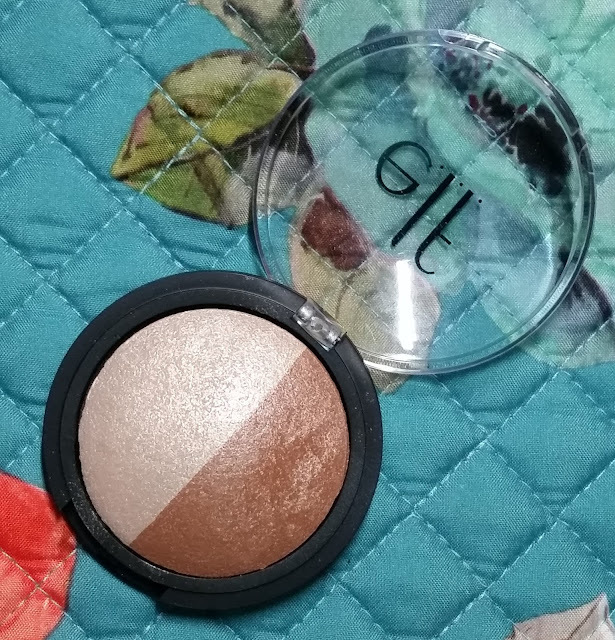 This particular duo contains a champagne-colored highlighter and a light, neutral-colored bronzer with fine particles of shimmer that add a bronzy glow to your face. Now, I did read up on this product and had seen very mixed reviews on e.l.f.’s site - people either loved or hated it. I’m personally not a fan of the product simply because I just don’t do shimmery bronzer, but I like the highlighter. It’s pigmented and picks up well on the brush and finger. With e.l.f.’s baked highlighter singles, I normally have difficulty picking up product with both my brush and finger, so I like the one in this duo. 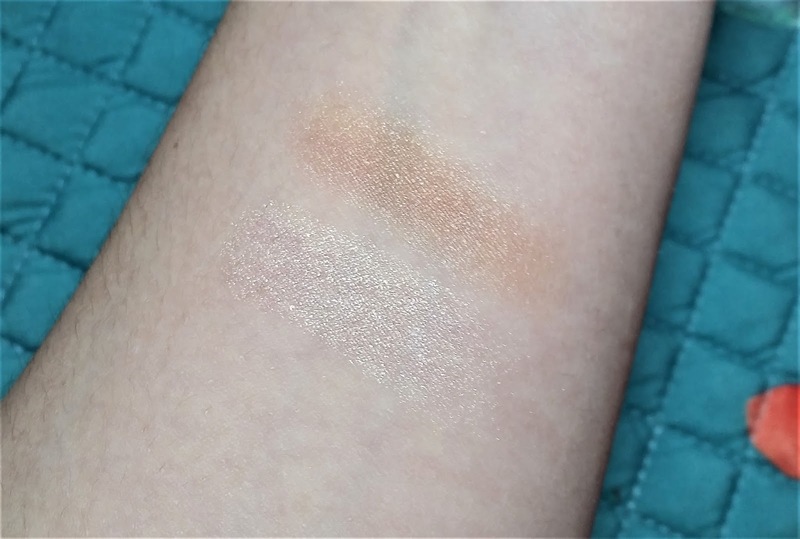 Swatch of Baked Highlighter and Bronzer in Bronzed Glow Bronzer (top) and Highlighter (bottom). The bronzer, on the other hand, you have to work with it a little to get it to work. It’s a pretty bronzer that has pigment when swatched, but it blends out so easily that it looks like you lose most of the actual color, but the shimmer is still there. You have to use a lot of product if you really want that bronze to stay. But I did find that if I apply it with my finger on my face first and then go in with a brush to blend, the color won’t dissipate as easily. Aside from that, it’s a pretty bronzer that’s shimmery enough to give your face a glow without you looking like a disco ball. For someone that wants that glow on a budget, this would be it. However, I would recommend the duo more for people of lighter complexions because the bronzer is a very flattering shade and works as such if you’re of fair to light complexion. If you’re any darker, it’s like an illuminator or a highlighter, especially when blended out. The next item is the Lip Exfoliator in Mint Maniac. It’s a sugar scrub packed into a lipstick-shaped balm that’s infused with Vitamin E, Shea Butter, Avocado, and Grape and Jojoba Oil to nourish and protect lips. I’ve actually used the Lip Exfoliators in the past and really like them because I have crazy dry lips, but I’ve only used the Original flavor. They had recently added more flavors with Mint Maniac being one of their older releases. After trying it out, I can see some differences between Mint Maniac and the Original that I’ve used, Mint Maniac being packed with sugar particles that are much smaller and less chunky than the Original. But overall, the Lip Exfoliants are pretty gentle, moisturizing, and its shape makes it more convenient to use than the scrub pots. And the last item is the Hydrating Bubble Mask. 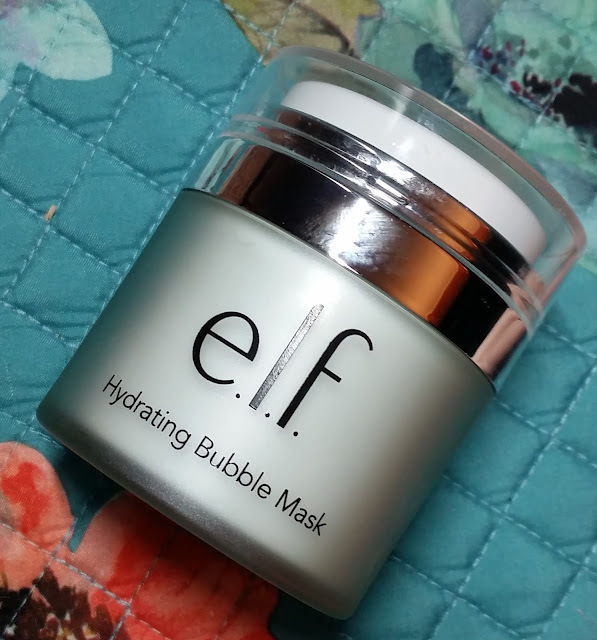 It’s a hydrating, gel-based mask that bubbles up to cleanse pores and remove dirt. After using this mask, my skin definitely feels cleaner and softer. For close to three weeks, I used this two to three times per week because I have oily, acne-prone skin. While one of the functions of the mask is to cleanse pores, I didn’t want to possibly over-hydrate my skin and clog my pores, just in case. However, this can be used every day if you wanted to because it’s gentle enough for daily use, especially for those with dry skin. I really love the bubbling action, so I use three pumps of the mask for a thick layer of bubbles. The one thing I don’t like about this product is the design of the pump. The design of the pump is a concave, flat top and when you press down on it, the product comes up and fills the concave. I just would have preferred a normal pump, so that the product goes straight into my hand and not have to scoop it out cause it does waste product and can become a sticky mess.